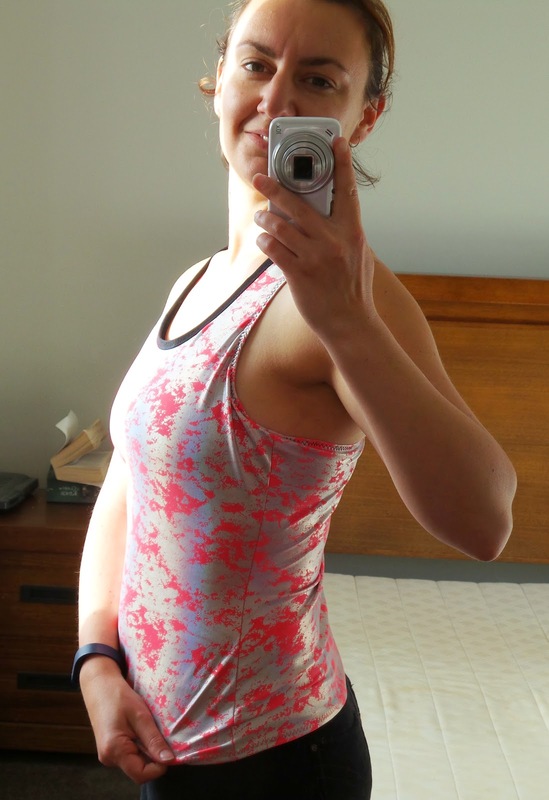 the engineer's other life: XYT - a fun FehrTrade workout top! Shiny garish fabric! My favourite for gym wear. The XYT pattern comes with great instructions, and a lot of additional handy hints. Melissa has also shared a lot of other people's makes and some extra tips on her website. I appreciate when designers are responsive and involved in this way - and this is not a trait unique to indie designers! The new McCalls blog is great too. The Y back design is perfect for me. I like having a lot of freedom in my workout tops, as I do both cardio and weights. Anything restrictive won't get worn. Y-back is great for weightlifting. I also think this style would be great as a casual top. I followed the instructions given, but tried using fold over elastic around the neck. It worked fine, if this is a look you like. I wouldn't use it under the arms though, as I suspect it might chafe depending what workout you're doing. 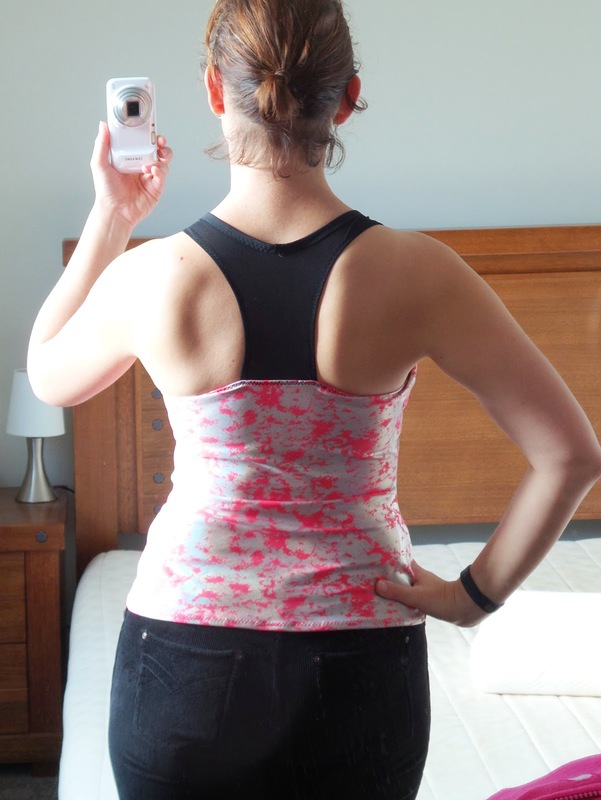 My Y back is the same mesh I used for the bra. All the hems are finished with a three-step zigzag, and I didn't use my overlocker at all. It took only a couple of hours from cutting to wearing. I sewed this one with the built in bra, no adjustments. I used an XS, going out to S from the waist to the hip. I think this sizing is right for me in this fabric. However, there are some definite adjustments to be made. There is a lot of pulling around the front armpit. I noticed this on a few of the other ones that I've seen on the web... however I suspect mine is exacerbated by G-cups. Possibly the fabric I chose as well - it is a 4-way stretch nylon-lycra from the Spotlight dancewear section. I added about 2cm extra length to the bra already, knowing that it wouldn't fit otherwise. Next time I will attempt the FBA that Melissa describes on her blog. This top doesn't give me enough support for anything except maybe weightlifting (certainly not running). But I would have been very surprised if it did! 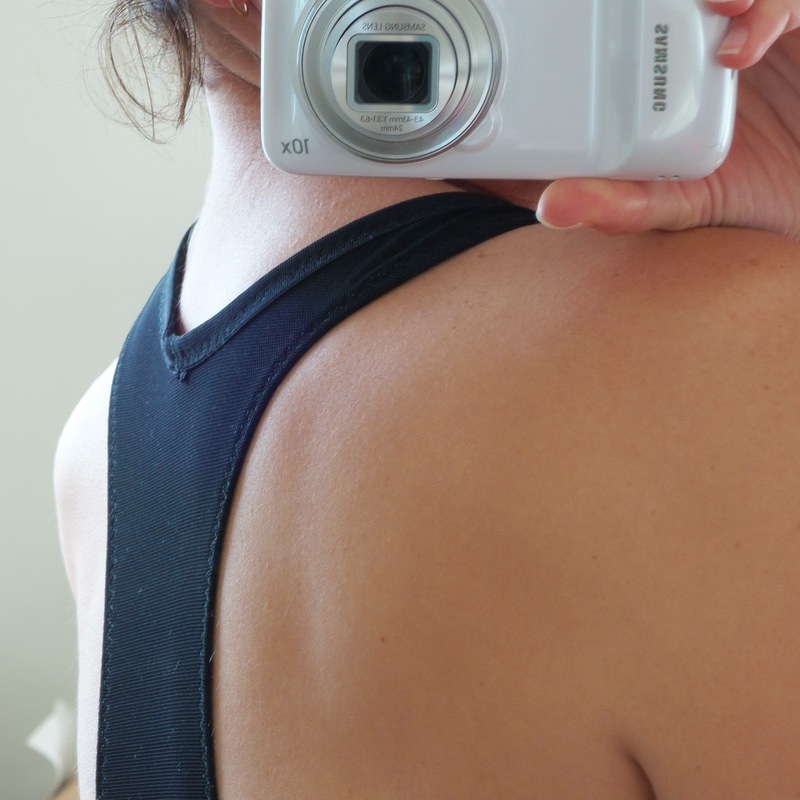 I'm rather a sports bra aficionado - thanks to wearing G-H cups over the last few years. Chris says he isn't embarrassed to be seen with me wearing it, so I guess it's four thumbs up! Any questions? Comments? Thoughts on how to fix the pulling issue? UPDATE: Melissa kindly offered me some suggestions on Twitter regarding my fit issues. While I don't think the price of a pattern in any way suggests an entitlement to personal service, I really really do appreciate it! It looks great and I love the print, too. 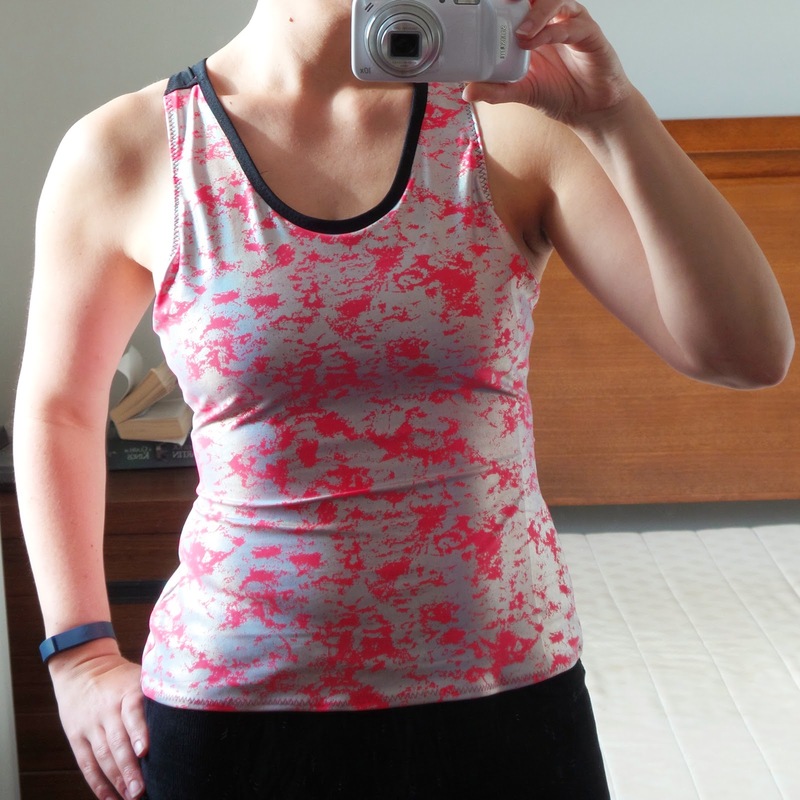 I think it's fantastic that you can pretty much make anything you need to - a custom-made workout top in just a couple of hours. Brilliant. I meant to add: the new layout looks great, too! Thanks Katie! After my blog hiatus, I thought a bit of fresh design might refresh my mind. I tend to find the gym tedious, so any excitement I can get by way of fun fabric is most welcome. And you're right - fundamentally it is excellent to be able to make things that just fit my wardrobe needs. Thank you! It looks great. I've made this a few times and find that I don't need to attach the bra to the armscye - just at the shoulders, which eliminates the pulling. I finish the armscye of the bra with lingerie elastic. Having the bra "free" is also more comfortable for me. 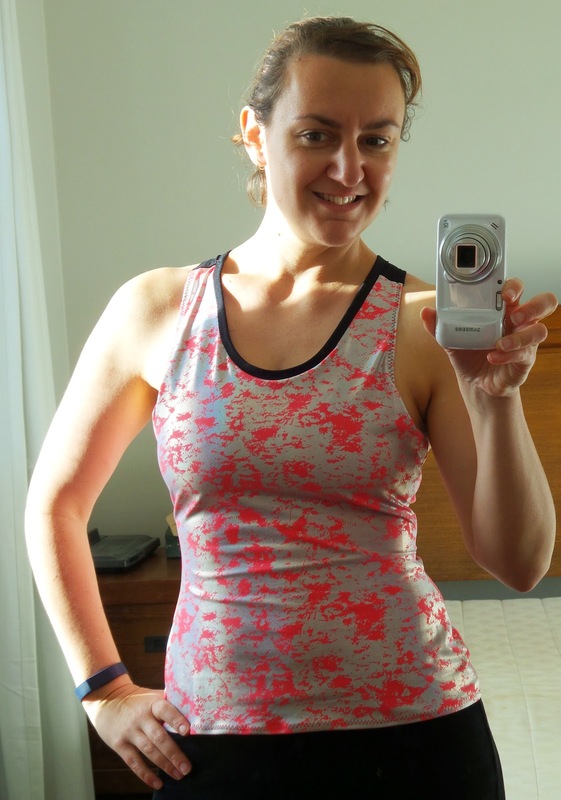 I wear a sports bra in addition to the powermesh bra, which works well for running for me. Thanks for the suggestions! Ultimately I will wear a bra with this too, and I like the idea of it being less attached to the top. To me it looks like maybe the issue is the fashion fabric is stretchier than the powernet? If that's the case then Sigrid's interfacing lycra tutorial might be the answer. You're exactly right - the compression bra is also significantly smaller than the outer shell. Thanks for the tutorial suggestion!